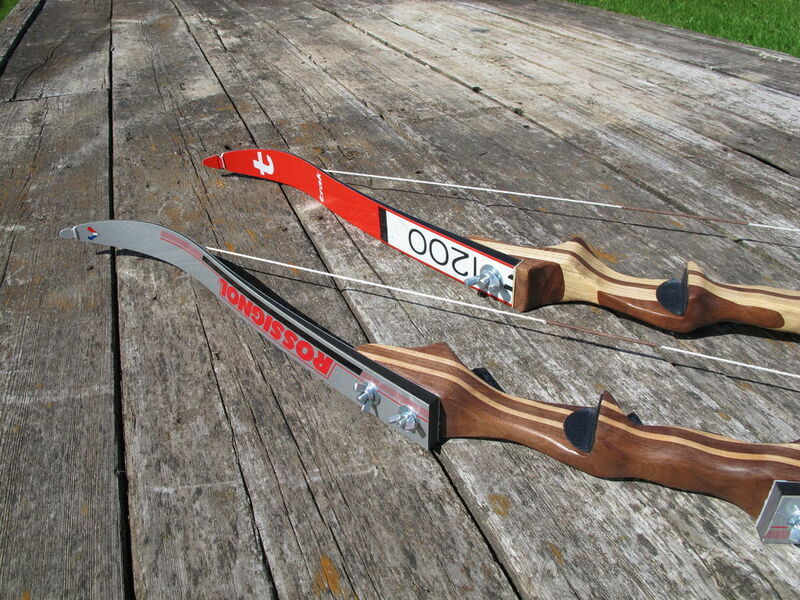 Skis are an excellent material to use for the limbs of a bow. First off, they are uniform. You won’t have to worry about inconsistencies in the material; you can expect both limbs of the bow to bend equally. This also eliminates the tedious process of tillering the bow. 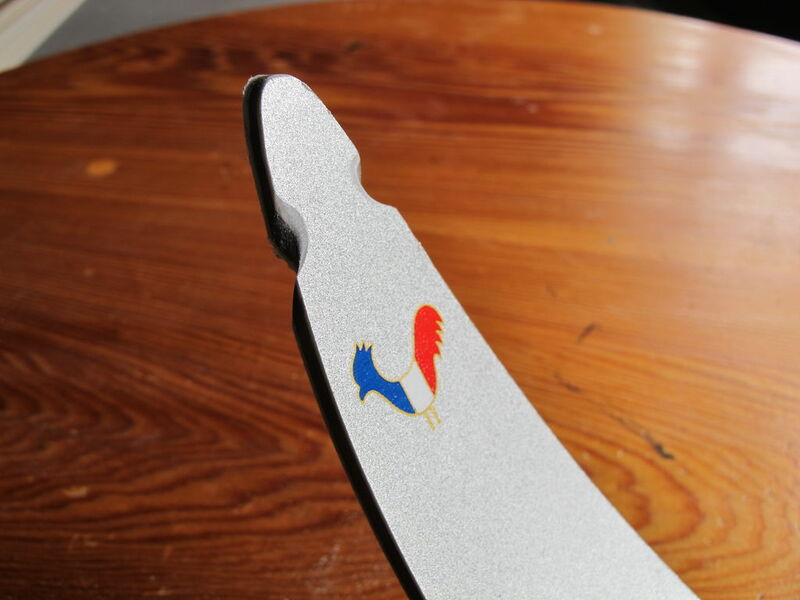 The front of the skis also already have recurved tips. All of this means using skis saves a lot of time. 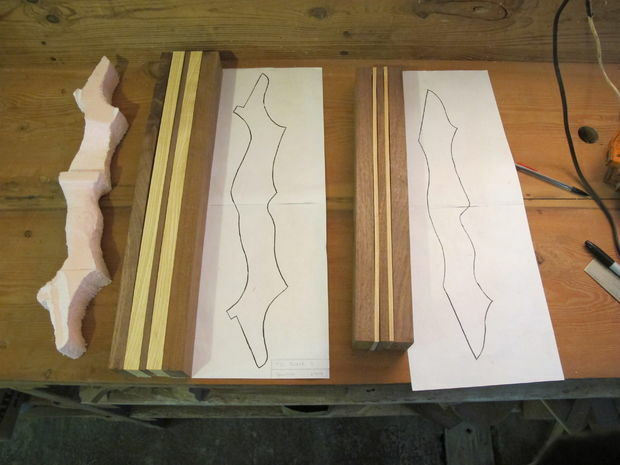 Lumber – to be carved for the riser. 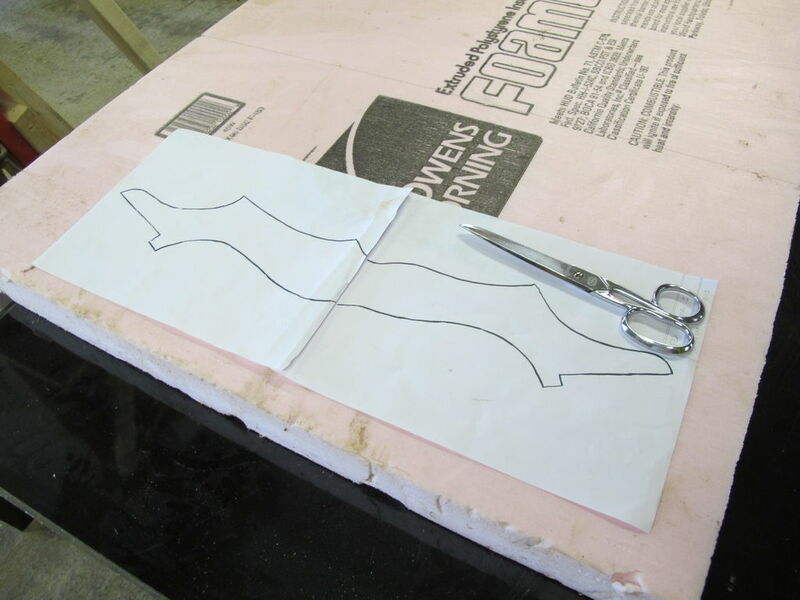 Either a large block (at least 3″x3″x20″) or scraps will do. 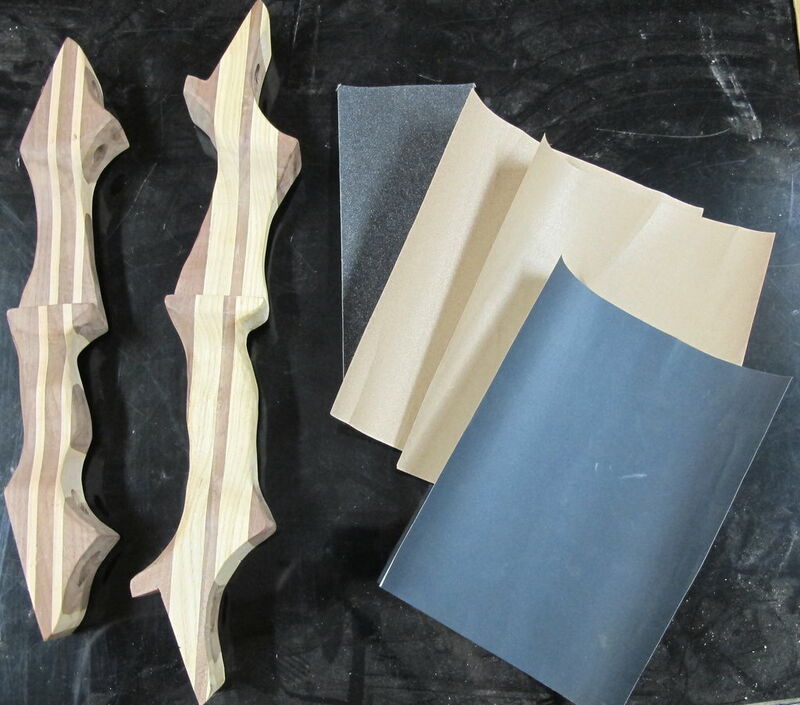 The following tools are not required to make the bow but will make the process a lot easier if you decide to make a more complicated riser (handle) for your bow. 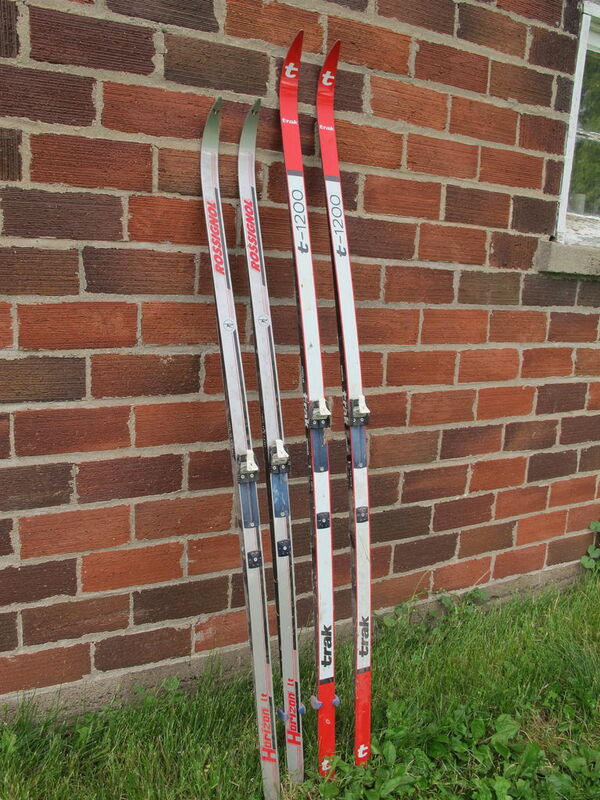 Skis ~$10 at a yard sale or Goodwill. 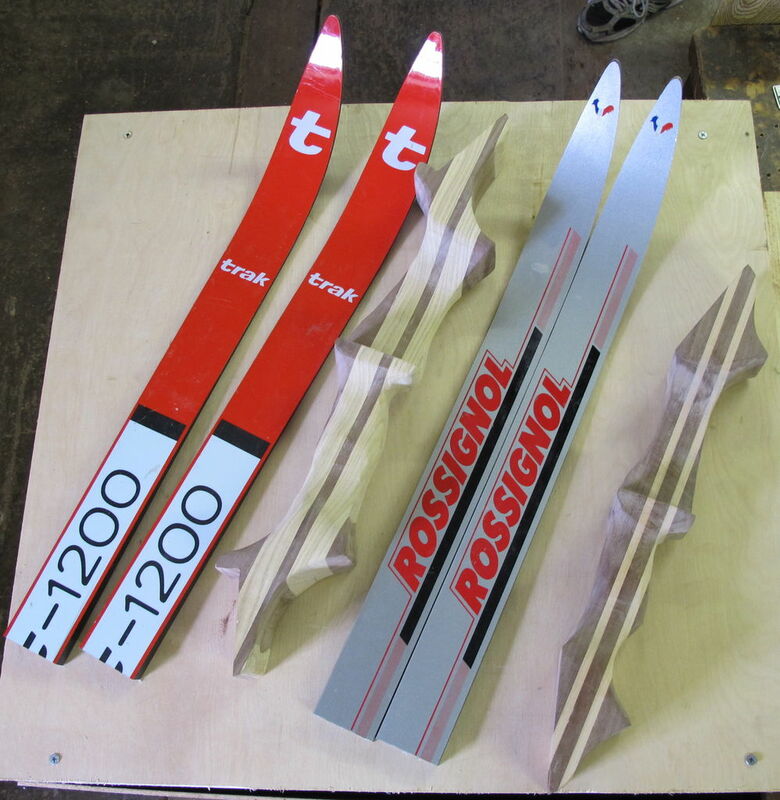 The skis used in this D.I.Y are cross-country skis. The bows turned out to be between 20-26# @ 28” draw. 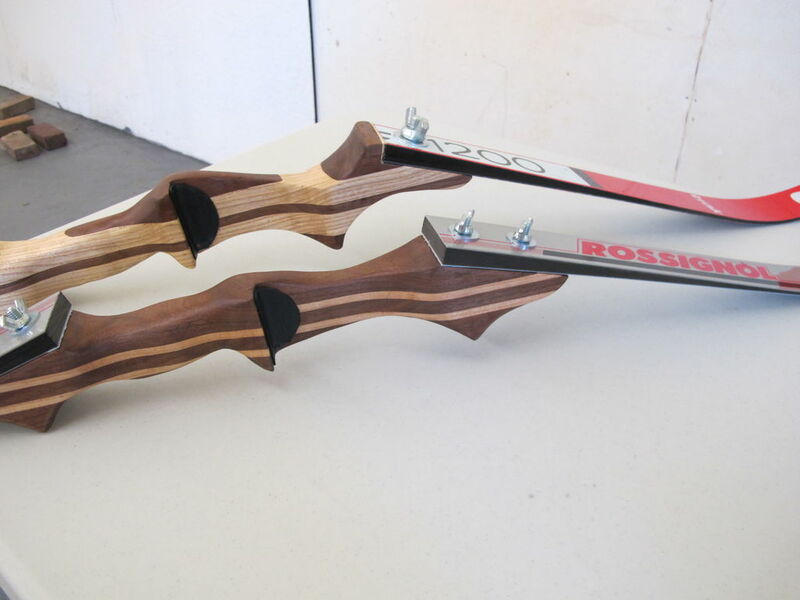 Bows made from downhill skis will be much stronger due to the increased rigidity; I’ve heard reports of folks achieving >60# with downhill ski limbs. 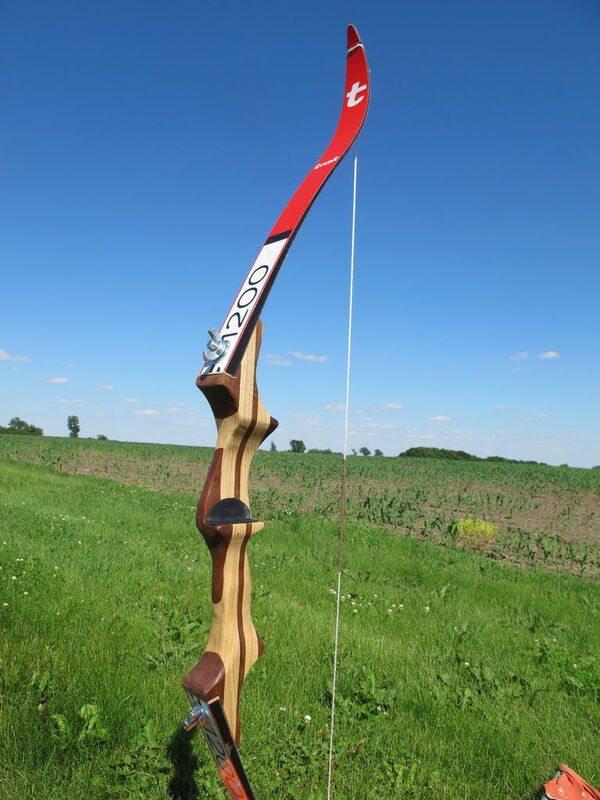 My initial goal was to make a more powerful bow but for some reason its really hard to find downhill skis in Iowa. 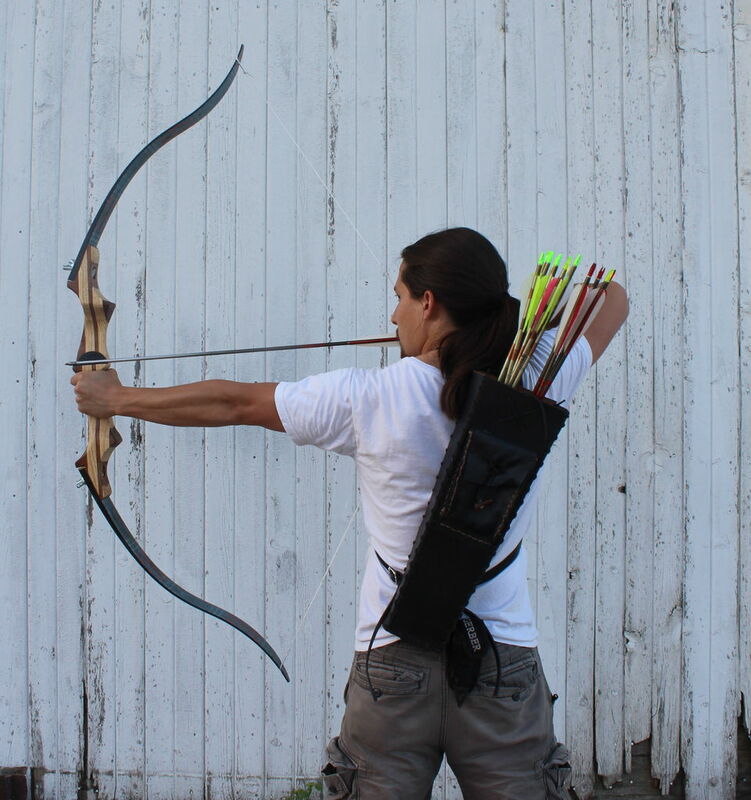 A takedown bow consists of two limbs that attach to either side of a riser, or handle, by some hardware. 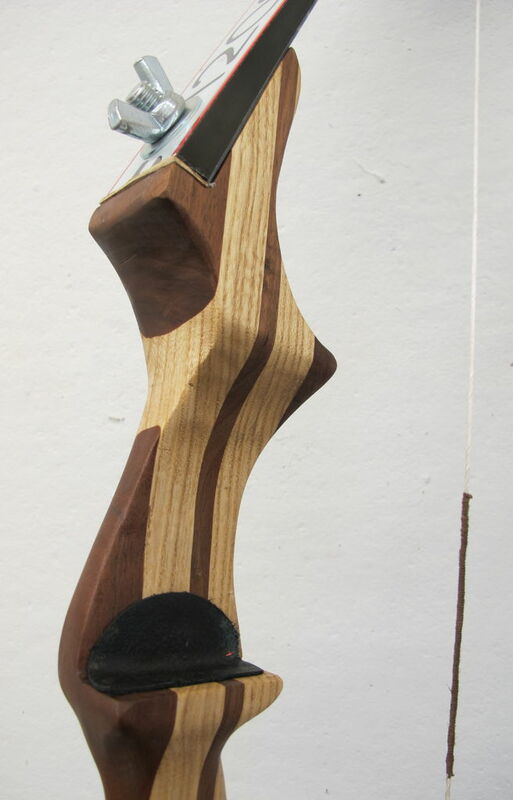 The riser needs to have a flat surface for the limbs to attach, a grip for your hand and a carved out shelf for the arrow. Here is the chance to be a creative in your design. The riser doesn’t flex at all when using the bow! As long as the riser satisfies those three things it doesn’t matter what it looks like. If you are need of inspiration just do a quick image search online for takedown risers. Or get really crazy/impractical and search for images of World of Warcraft bows. Start by sketching your riser on a couple of sheets of graph paper. I drew a few thumbnail sketches on graph paper to get some ideas before starting in on the full size drawings. The two risers I designed were about 20” and 18” long. The riser sketched on the left was designed to have only one bolt holding the limb down where the riser on the right was designed for two bolts per limb. EDIT: The drawings for the risers made in this Instructable are included as pdf’s in the final page. Note: The angle made by the vertical axis of the riser and the attached limb should be around 15˚-20˚. If the angle is greater the limbs won’t flex as much when pulled resulting in less powerful bow. Don’t stress about this too much! 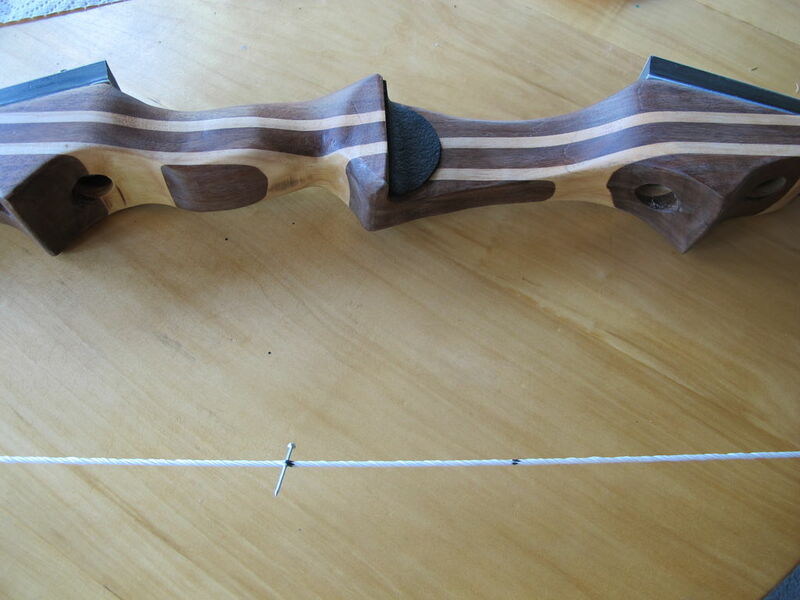 Even at the end when the bow is fully constructed there are ways to change the angle to increase draw weight. We will cover that later. 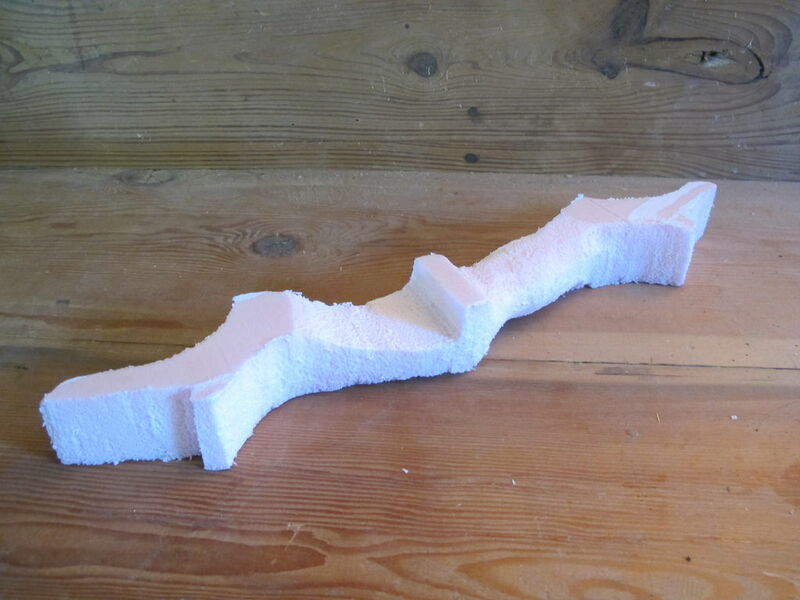 Next I made a model of the riser out of 2” thick foam. 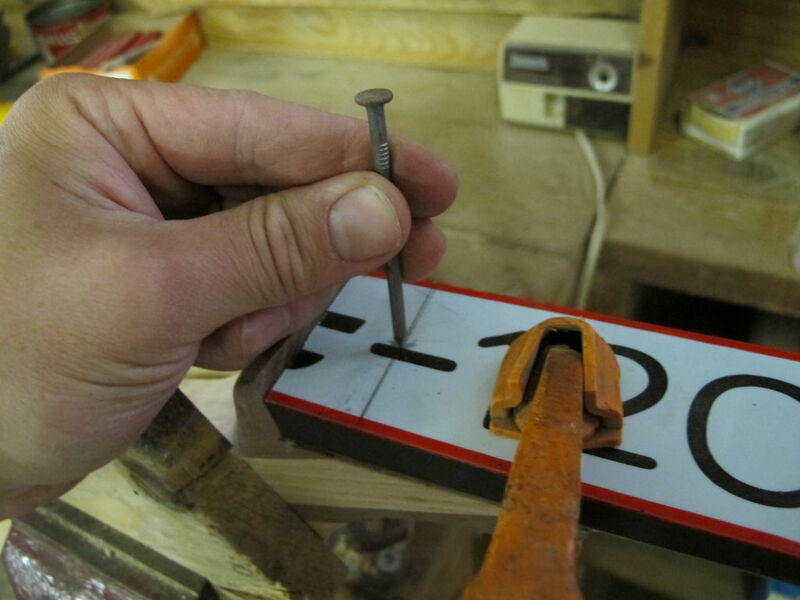 This step is not completely necessary but it can be helpful to use as a guide when carving the wood riser later. 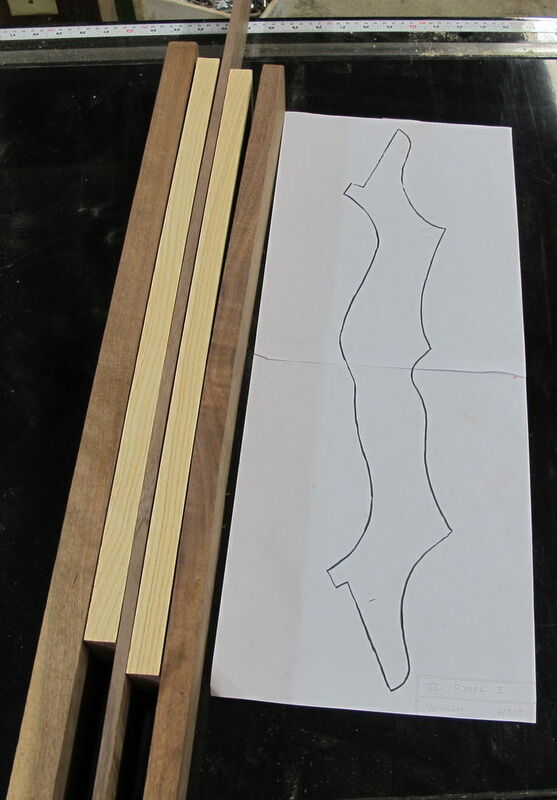 First trace a copy of your riser design so you will still have the original drawing to transfer to wood later. 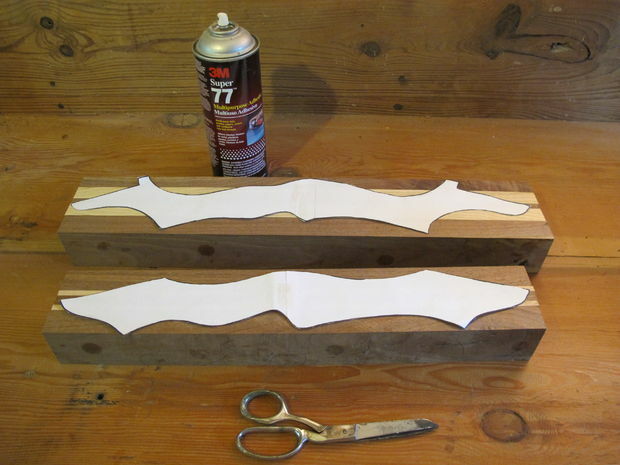 Cut and glue the design to the foam and carve with a craft knife or wood rasp. You can test out alterations to things like the handle or curves of the riser on the foam before permanently removing wood. For me, the foam model was really helpful. I’m not great at translating the 3d image in my head to a 2d drawing. Having a 3d foam model allowed me refine my design as necessary before starting in on the actual wood. Depending on your preference and what materials you have available this step can either be rather short or take a fair bit of time. I didn’t have a single piece of wood that was large enough to make the riser so I ended up laminating several strips of hardwood together with glue. The latter method allows you to introduce different colors into the riser as well. If you decided to use a single block of wood square up the edges as best as possible with a tablesaw ,or better yet a jointer and planer, and move on to “Rough cutting the riser”. 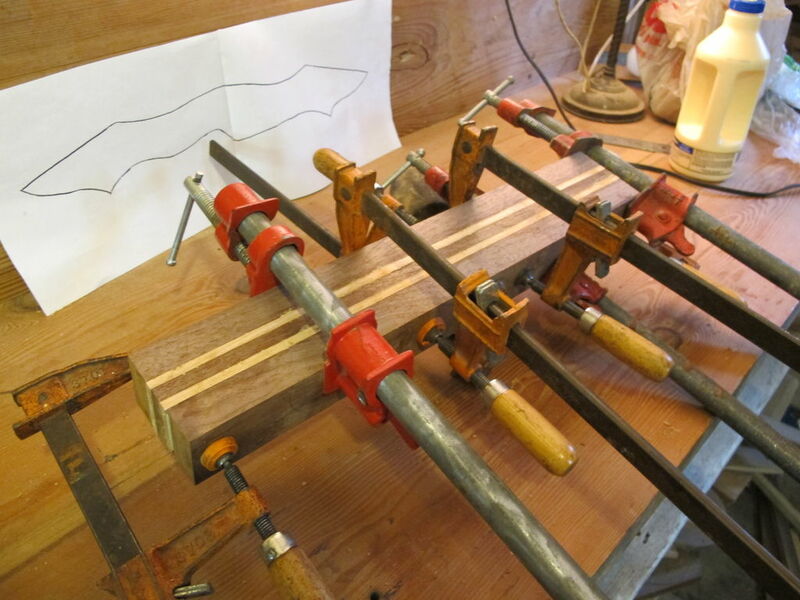 If you want to make a pretty laminated riser, read on. 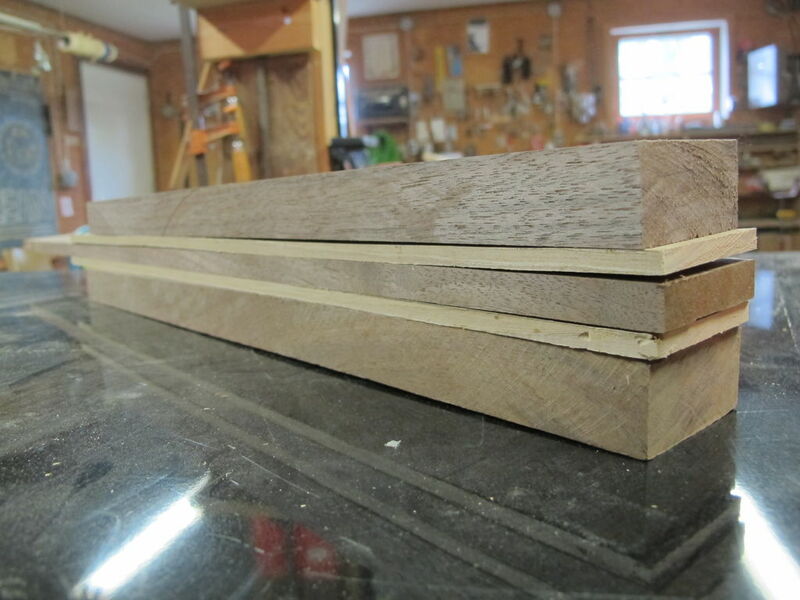 Here are some scraps of walnut, oak and pecan for the risers. Take a little bit of time to play and arrange the strips of wood to create some interesting color combinations. Rip (cutting with the grain) all the strips to the same width on a table saw. The width that you should be aiming for is about an 1/8” wider than the widest part of the ski. For me that was about 2” with both sets of skis. The 1/8” excess on the riser will be removed later on when sanding. 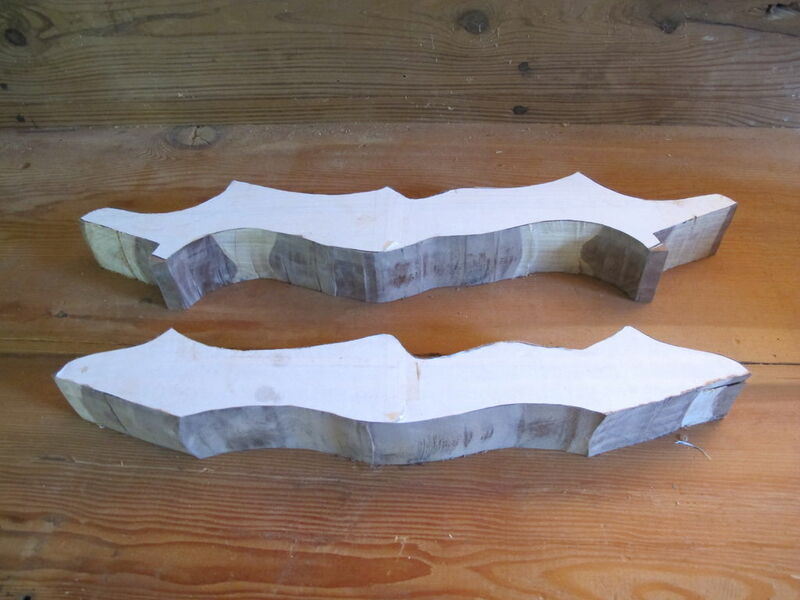 Next cross-cut (cutting across the grain) the boards to the same length. I used a radial arm saw for this step. Notice how the strips of wood that I ended up selecting were a bit warped. 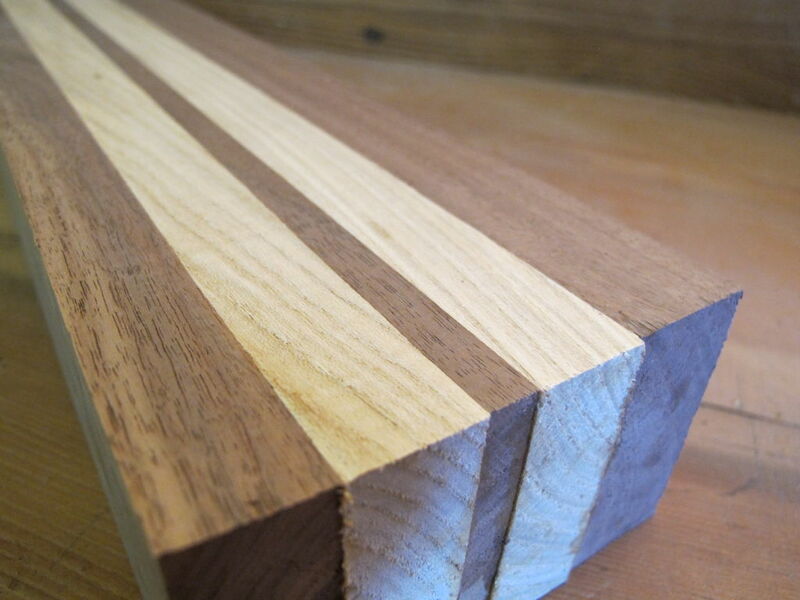 To make a good glue joint, it’s important that the wood fits together as smoothly as possible. 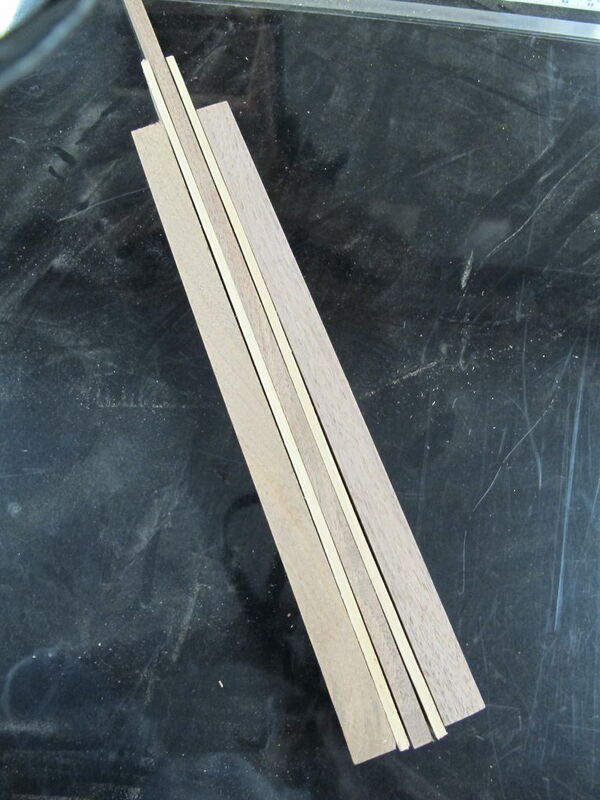 If you have a planer, flatten the boards or do your best to sand any particularly rough pieces. The wood is now ready to be laminated. Any woodglue ought to do just fine for our purposes. Below I’m using Elmer’s woodglue. Halfway through I ran out and started using some Titebond II. If you end up sealing the wood later with some sort of polyurethane finish (which I highly recommend) its not too important that you use a waterproof glue like Titebond. 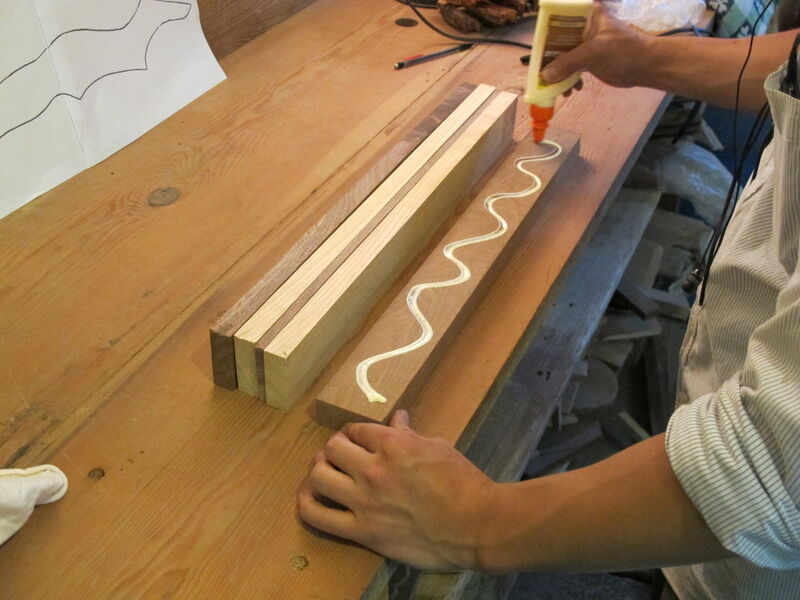 Start by drawing a thin bead of glue across the wood and then smooth it over the entire surface of the wood to create a thin, even layer. 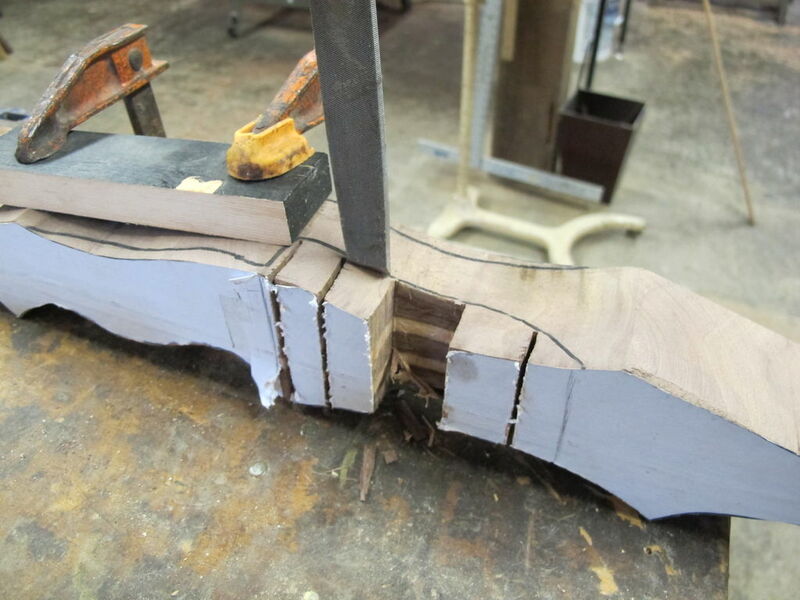 Once glue is applied to all the pieces, clamp them together and wipe off any excess glue drops from the outside. Make sure that there aren’t visible spaces between the boards. Let sit overnight. If you decided to glue all the strips together at once to save time your boards may end up uneven like this. It is best to get them as smooth as possible before we continue. 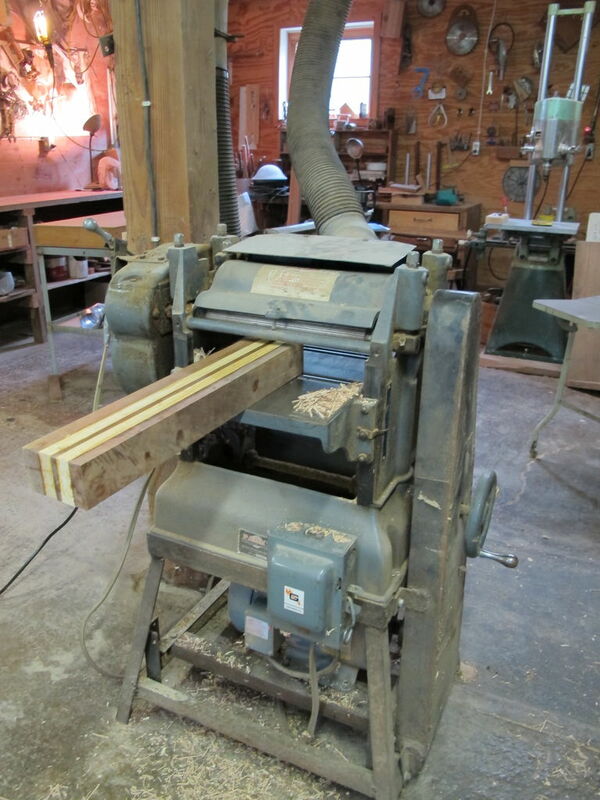 For me, it’s back to the planer. To avoid uneven boards like this, glue fewer strips of wood together at a time so there are less “moving parts” when clamping. Now that you have a squared smooth block of wood (or laminated woods) its time to cut out and spray adhere the pattern to the block. 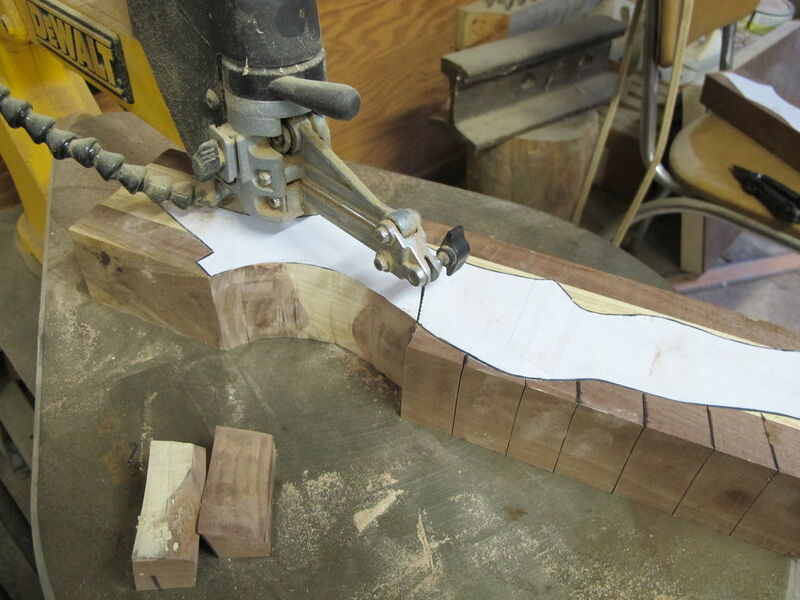 Rough cutting the riser is best done with a band saw, but a scroll saw like the one here will do just as well. First draw and cut a few relief cuts from the edges to the paper. They are the black lines in the above photo. The relief cuts are small cuts made in the waste wood (the part of the wood we are trying to remove) from the outside of the block to the pattern. After all the relief cuts are made, start in on the curve. As you reach the relief cuts the pieces will just fall away as shown here. This provides a natural stopping point anywhere along the cut. It’s now time to cut the arrow shelf. Turn the riser on its side and draw in the shape of the shelf. 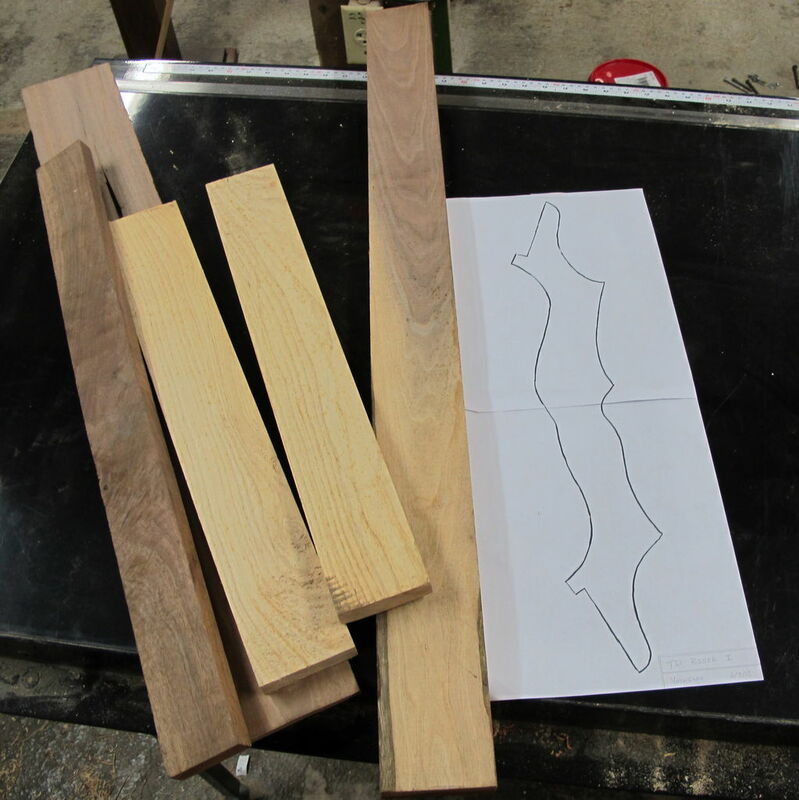 If you have a band saw, cutting the shelf is rather simple – just do the same thing as you did to rough-cut the shape of the riser. 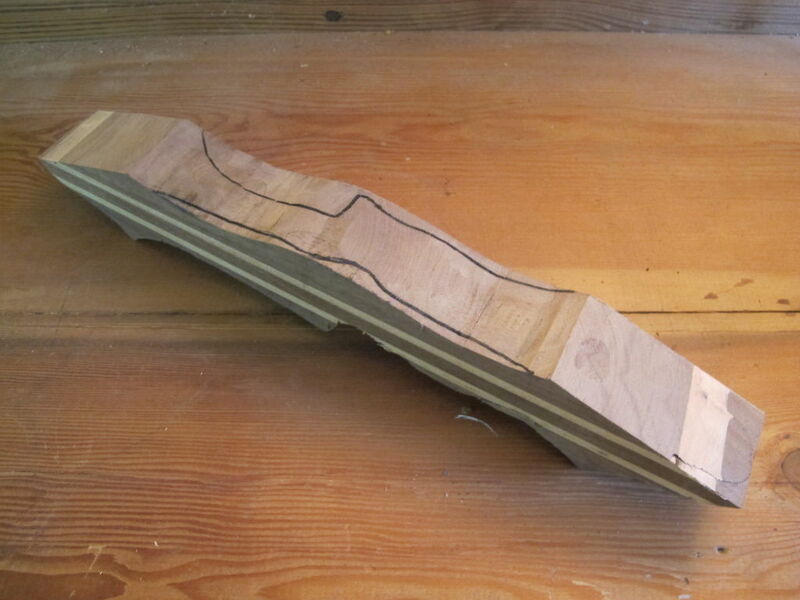 If you only had a scroll saw like I did you might need to use a chisel for this step. 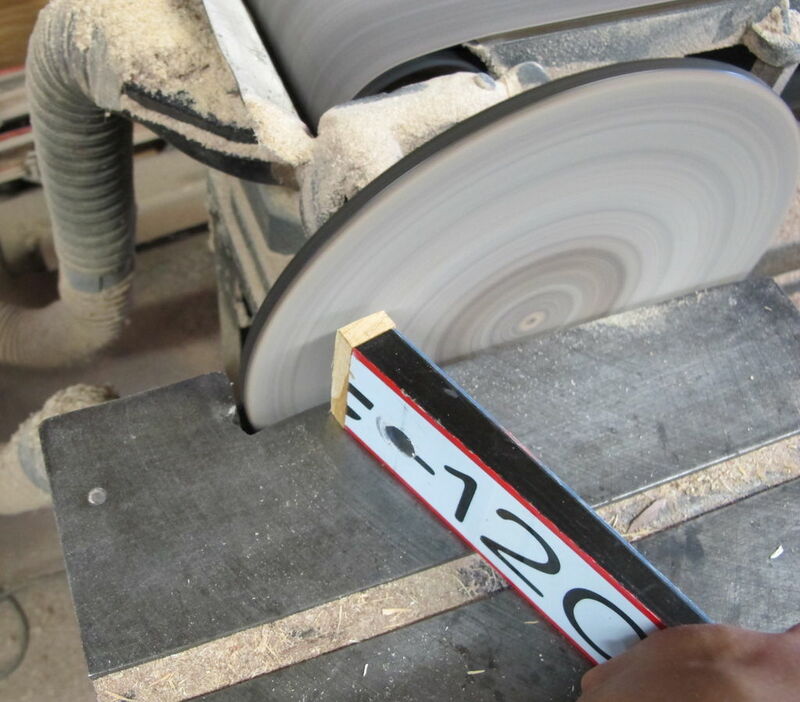 Most scroll saws can only cut wood up to two inches thick. The risers I designed are closer to 3 – 3 ½” wide when turned on edge. 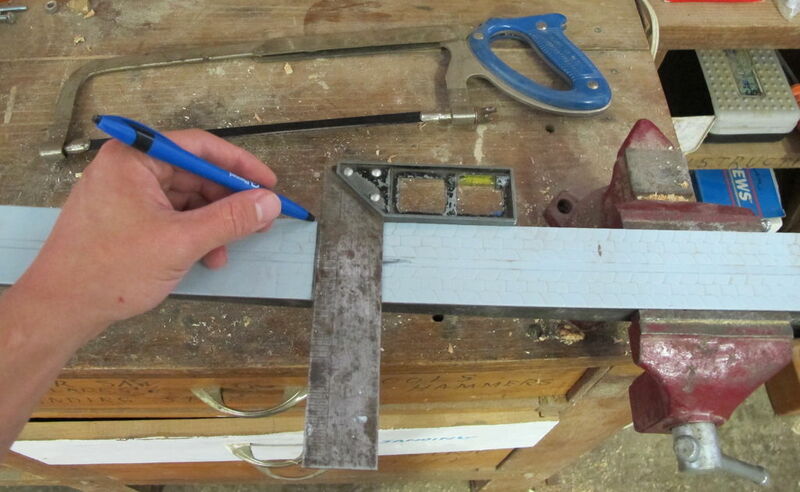 To chisel the shelf, start by clamping the riser down to a bench and cut vertical slits with a handsaw. Next, flip the riser on its edge and clamp it down again. With the chisel and hammer, taking care to hold the chisel as perpendicular as possible to the riser, cut out the pieces with even blows. 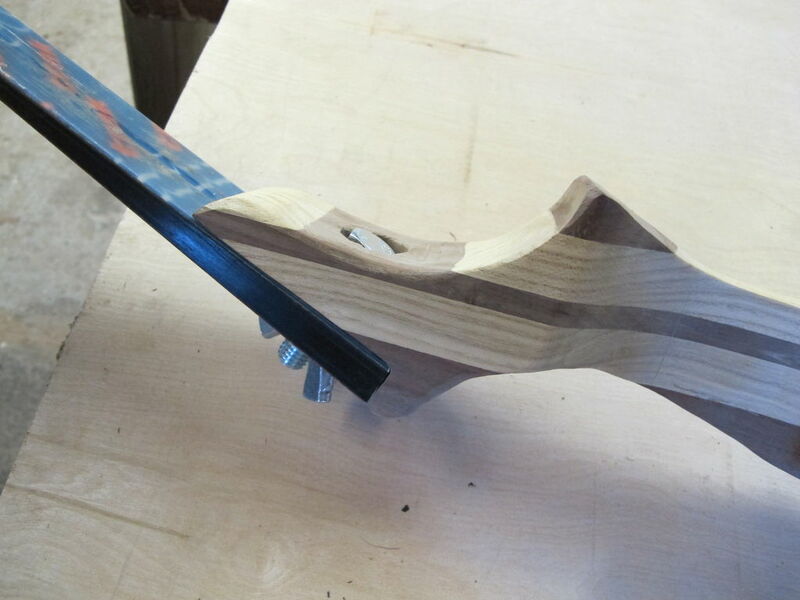 From here, its time to rasp, file and sand the risers for the final, smooth shape! I did most of the shaping with a disk and belt sander. 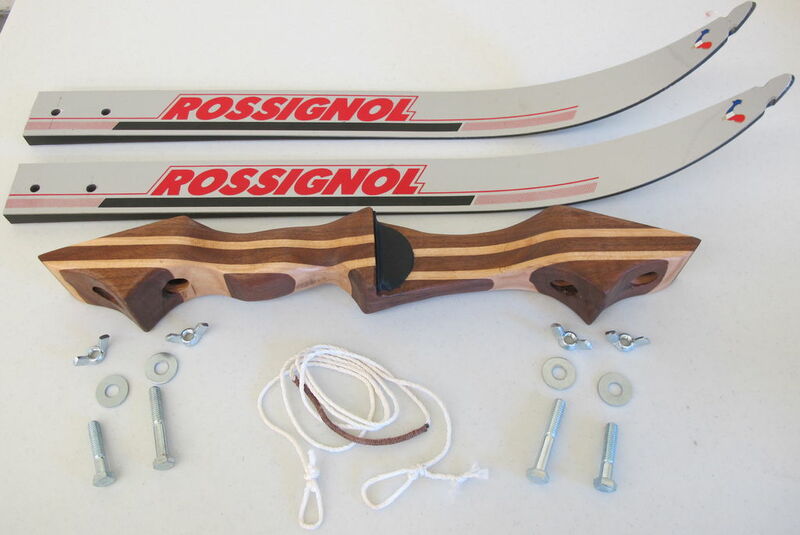 To get an idea of what the bow will look like when unstrung, lay the ski and the riser next to one another as shown below. You don’t want the limbs to be too long or you could lose some power. That is especially a concern with cross-country skis as they are less rigid. For an 18” riser, I cut the limbs to be 22” including the section that overlaps with the riser. The limbs were a bit longer for the larger riser to keep it looking balanced. 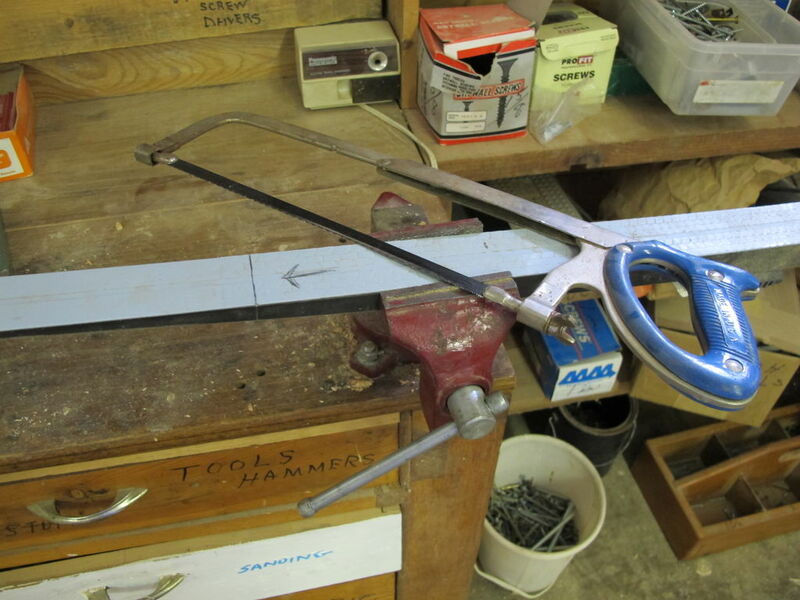 Use a square to make an even line across the ski and cut it to size with a hacksaw. Avoid using a radial arm saw or chop saw for this especially if your skis contain metal reinforcements. Check that the ski is actually square after cutting. If not, sand or file it flat. 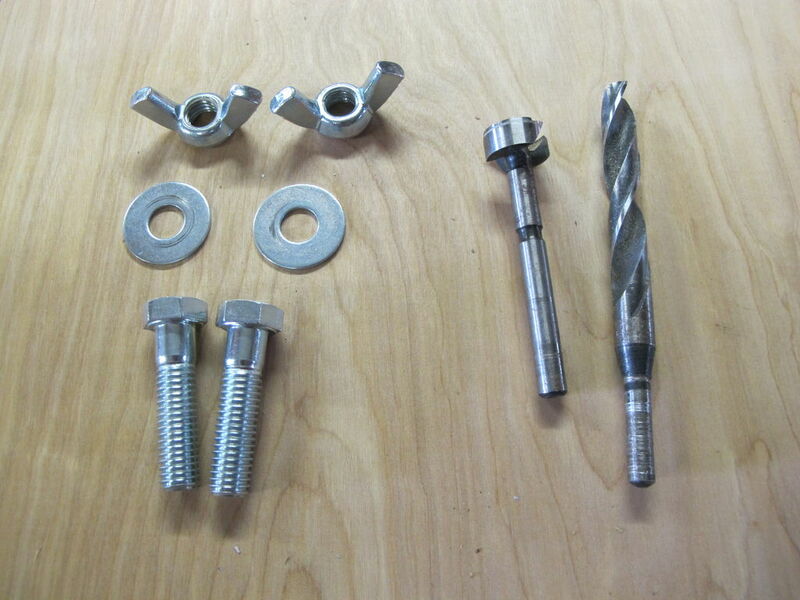 The number of bolts you want to use to attach each limb will probably dictate the diameter of the bolt you use. For the bow with only one bolt per limb I used these 1 /2 ” bolts. For the other riser I used 5/16” bolts. To drill the holes, select a bit that is the same width as the outer threads of the bolt. You don’t want the threads to bite into the wood at all. The bolt should go into the hole with no resistance and shouldn’t wiggle once it’s in place. Ideally for this step you would use a drill press. 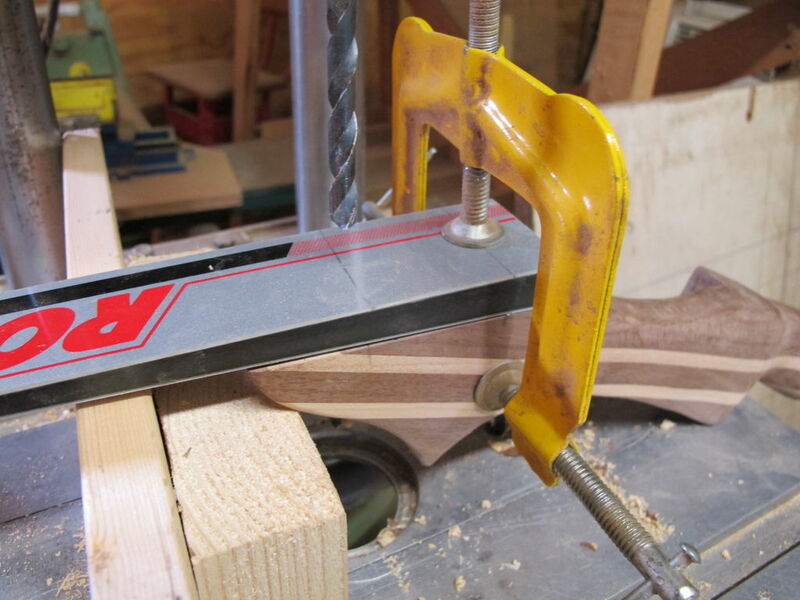 Clamp the ski and riser to the bed of the drill press checking to make sure you are perpendicular to the bit. 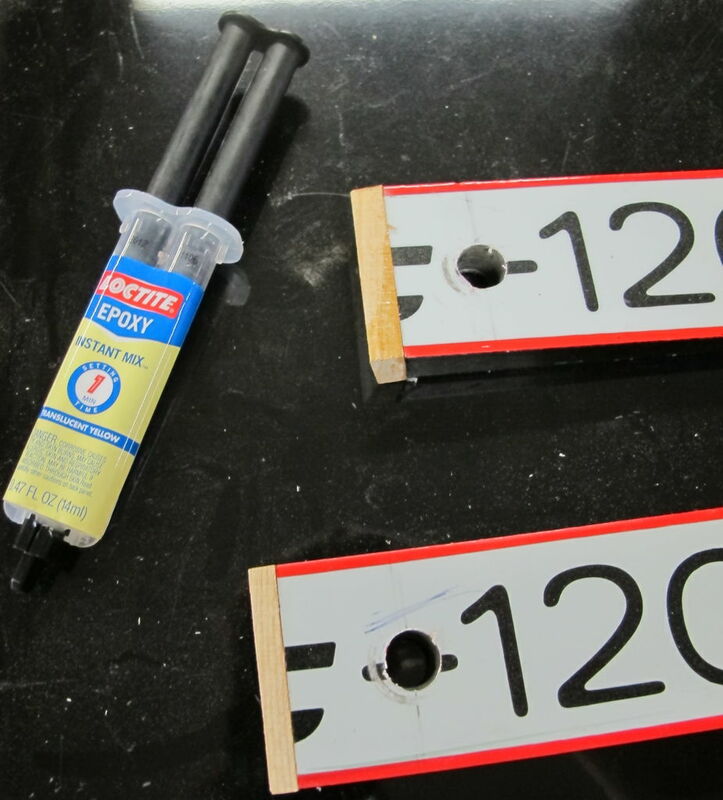 If you don’t have a drill press you can still drill these holes with a hand drill..
Make a mark with a nail in the center of the ski about 1 ¼” away from the end. 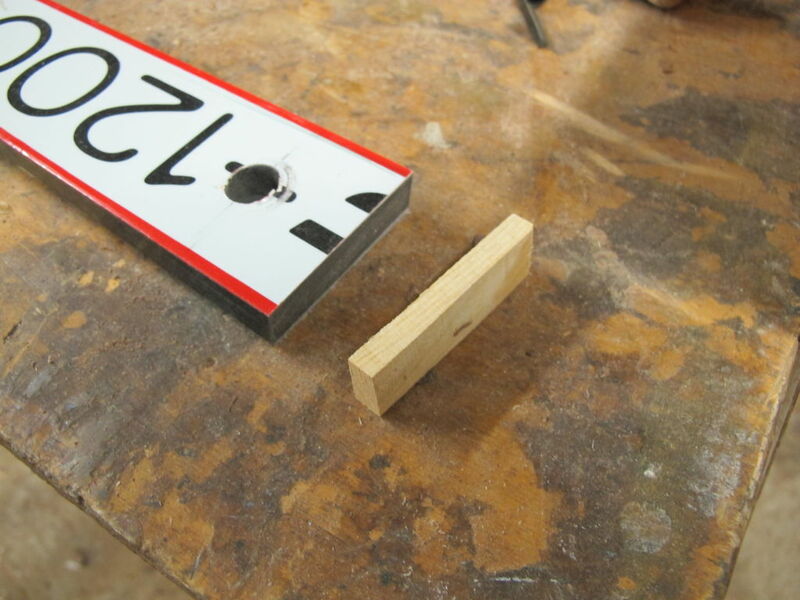 This will help to keep the bit centered if you are not using a drill press to make the holes. If you can clamp the limb onto the riser and drill both together do so! Otherwise you can drill them individually. To stop the head of the bolt from biting into the back of the riser its necessary to counter sink the holes. Use a bit that is a hair wider than the widest part of the head of the bolt. 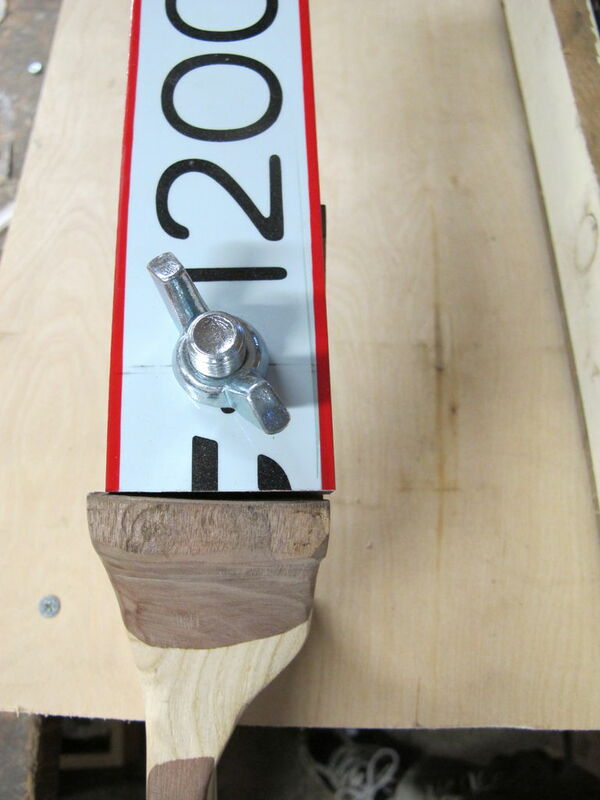 Determine how far down you want to countersink the holes by holding the bolts across the limb and riser as shown below. 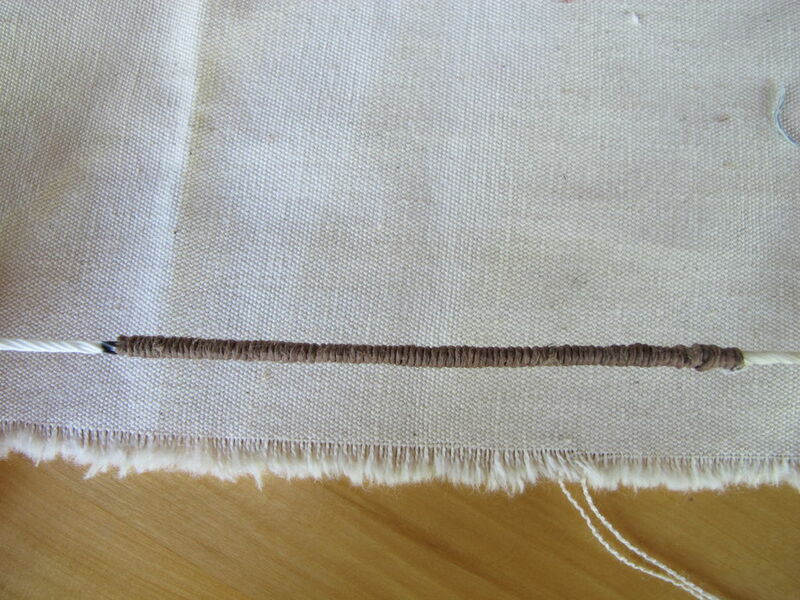 You want to have about ½-3/4” of exposed thread coming out the front to put on the washers and wing nuts. Mark the wood lightly with pencil and back to the drill press (or vice and hand drill). Step 8: In case you messed up..
Time to sand out all those tool marks and scratches! I went up to ~400 grit with the sanding. 220 grit should be totally fine. 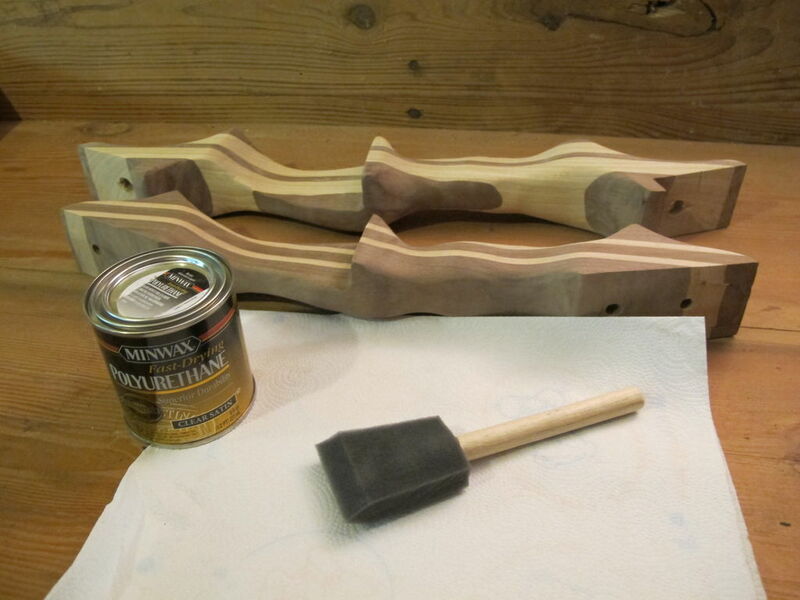 After sanding, wipe off the dust and coat it with some finish. I applied two coats of a satin polyurethane finish sanding in between each with 400 grit sandpaper. Half-hitch, from here trim and melt. The hemp goes THROUGH the nylon string. 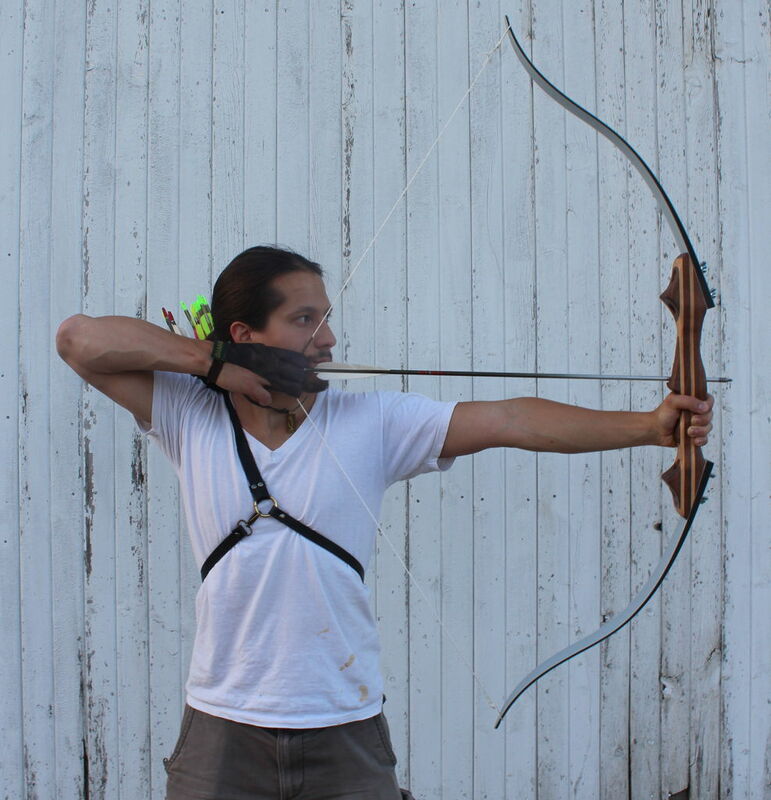 For a weak recurve (25lbs or less) it’s not necessary to reinforce the tips of the limbs. A few small files I use for jewelry worked well to carved the notches. 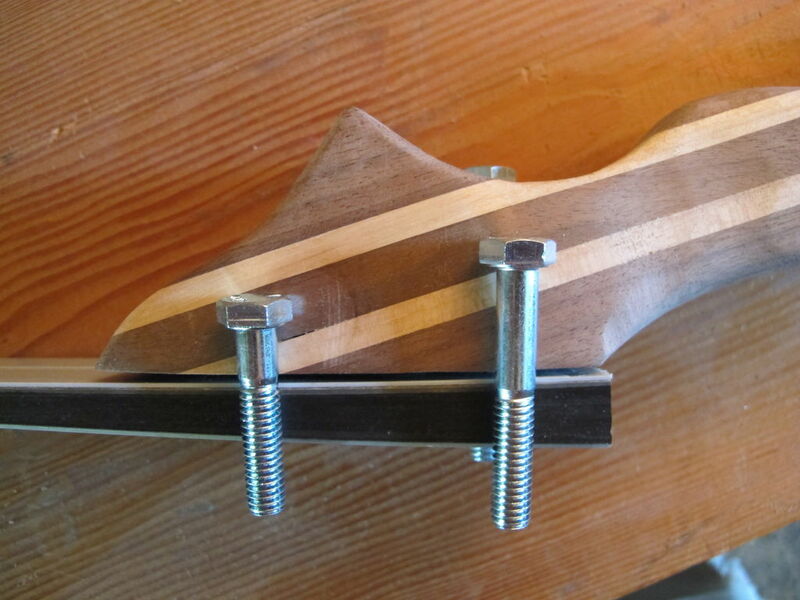 Be sure to round over the edges of the groove so that the string won’t wear out with use. For these lighter bows nylon twine will be more than strong enough to serve as a string. 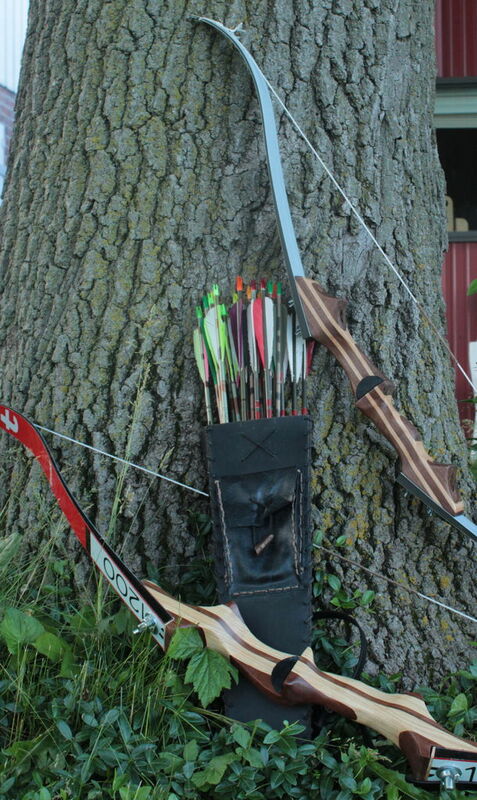 The twine itself is a bit too narrow for the nocks of arrows to grab and shoot accurately. 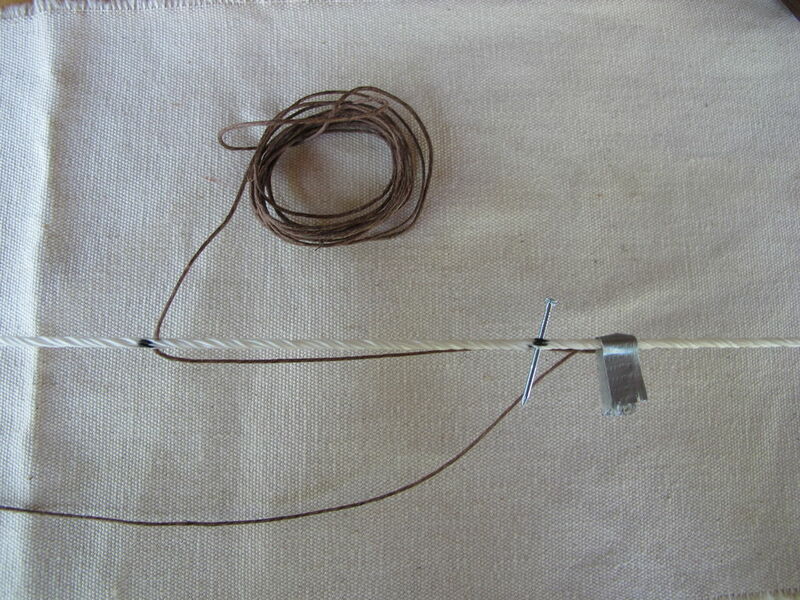 This can be worked around by twisting the string in a special way (shown below) to double its thickness. Before making the twisted string, determine how long it will need to be by stringing your bow with a bit of untwisted twine. Tie two bowlines on either end of the twine and string the bow. A string that is too long or too short for the bow will greatly hinder its performance. 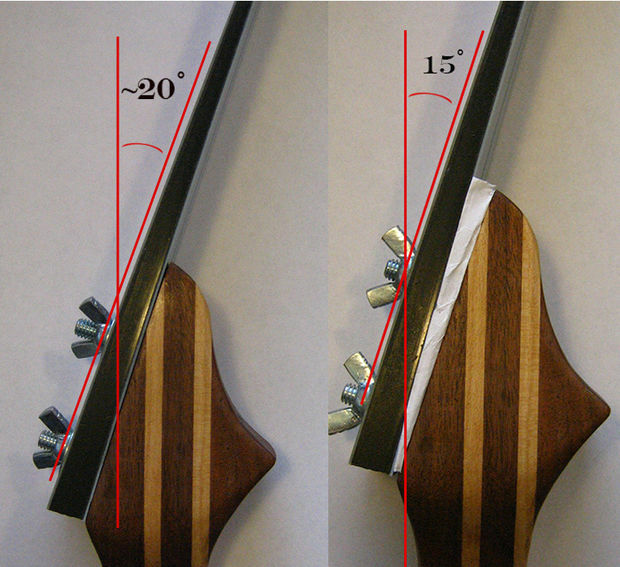 The distance between the string and the riser is called the brace height. Although it will be slightly different for each bow a good ballpark range is around 7” for the brace height. 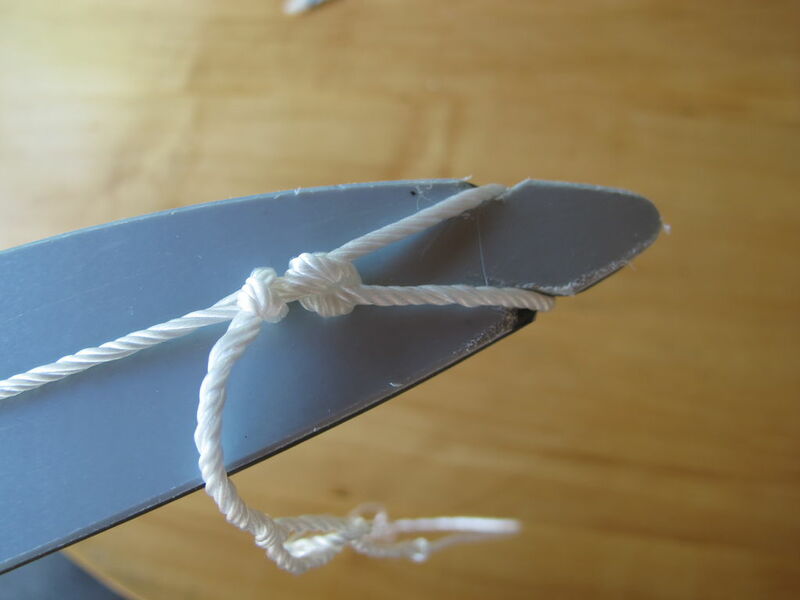 To make the twisted string that will actually go on the bow, cut a piece of twine that is three times the length of the twine just used to string the bow. A video showing how to twist the string is below. 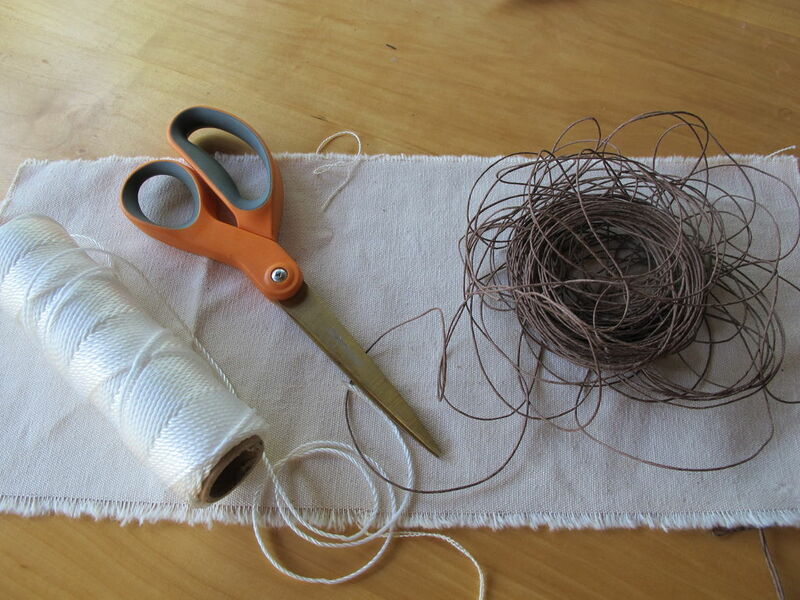 In case its hard to see, here’s what is happening: Fold the string in half with a loop on one side. Pinch the end of the loop with one hand. 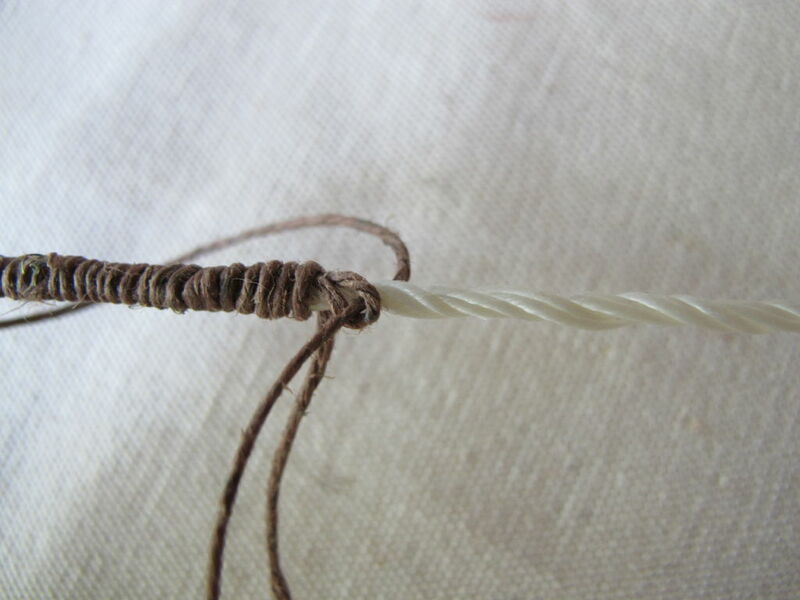 With your index and thumb of the other hand, twist the top strand away from you. At the end of the twist grab the bottom strand between the top of your index finger and the pad of your middle finger. Rotate your hand back to the front while holding all the strands. Inch your hand that is pinching the loop toward the newly formed twist. Repeat. NOTE in this video I am showing the twisting process with the hemp string as it is a lot easier to see in the video than the nylon. You want to twist the nylon twine for the bowstring NOT the hemp. Now that you have a large piece of twisted nylon twine, tie a double knot in the end to stop it from unwinding and cut and melt the end. Tie a bowline on either side of the string at the appropriate spot on the string Follow each bowline up with a simple overhand knot and cut and melt the ends. Almost done with the string! The section of the string where you grip and nock an arrow takes a lot of abuse while shooting. An additional thin layer of twine can be added to reinforce this area. This process is called serving the string. The serving should span a few inches blow the arrow shelf to a few inches above. To stop the serving from coming undone and sliding up and down it will be necessary to thread the hemp twine through the bowstring. 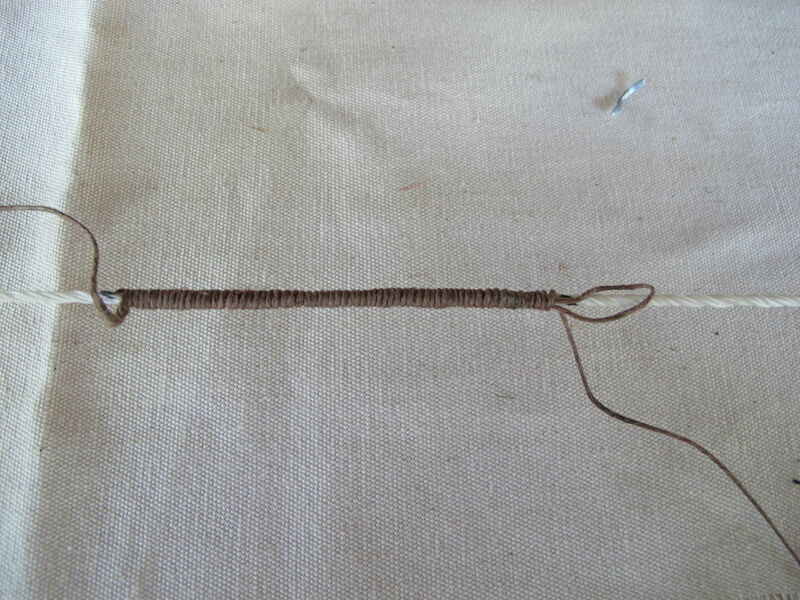 A small nail can be inserted into the twisted bowstring to aid in threading the hemp. The tape in the above photo serves to hold the hemp in place during the twisting. This method is similar to a basic whipping. However, the hemp to weak to try and pull the end loop back into the coil. 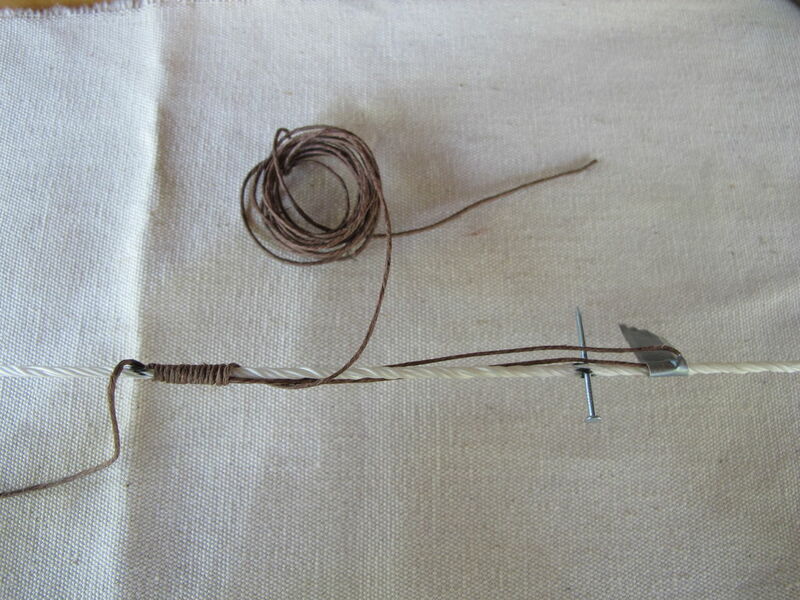 Instead, thread the working end of the hemp through the tiny exposed look and through the bowstring. Tie a clove-hitch, trim the excess and apply a dab of superglue on the end to keep it from coming undone. The bow is now fully functional! Yay! To make the bow even more pretty I added some leather on the arrow shelf. Step 12: Go shoot your new bow! Here is a silly video of me assembling and shooting the bow. Enjoy! I hope you enjoyed this D.I.Y! I will be happy to answer any questions you might have. Thanks! Here are a few ways to increase the strength of your bow. The smaller this angle the more the limbs will be forced to flex when pulled thereby generating more energy. For reasons of not putting too much stress on the skis (they do have the potential to break) I wouldn’t decrease this angle below 10˚. The easiest way to change this angle is to cut a small shim of wood and drill the appropriate holes. Insert the shim between the limb and the riser and bolt them all together. To make the shim more visible in the photograph I have wrapped it in some paper. Shimming the limbs increased the pull of this bow from 26# to 30#. If the limbs are too long the bow can be rather weak. Longer limbs will flex less when pulled. Less flex = less force. The further the string can be pulled and the limbs can flex without breaking the stronger the bow. Limbs that are too small can be broken as they flex too far with a standard draw. My advice: If you want to change the limbs, take 2 inches or so off each limb. Re-drill the holes and make a new string. 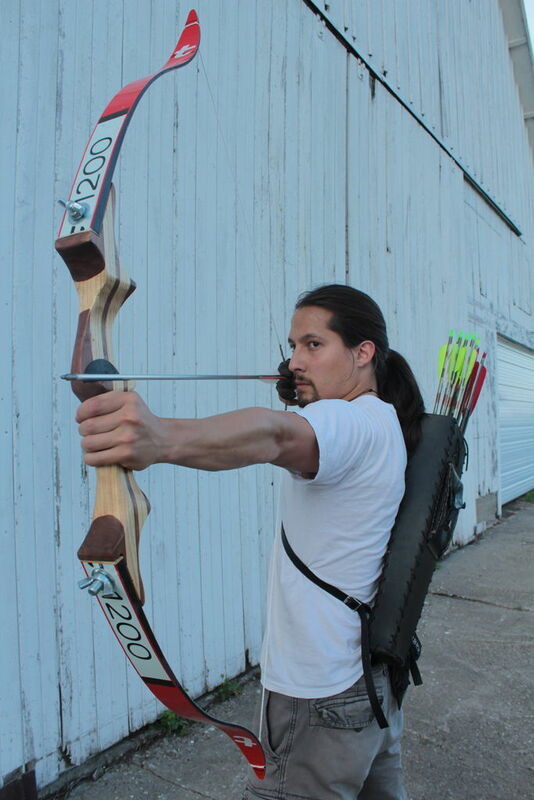 Not all of the force that is stored in the bow by pulling the string is transferred to the arrow on release. A significant amount of the energy is used to move the limbs back to the resting position. If the limbs are lighter less energy is required to move them thereby increasing the energy imparted on the arrow. This doesn’t change the draw weight of the bow but instead makes the bow more efficient and powerful. Because the tips of the bow limbs must travel the furthest to reach the resting position they are often the portion of the limb that gets shaved down. 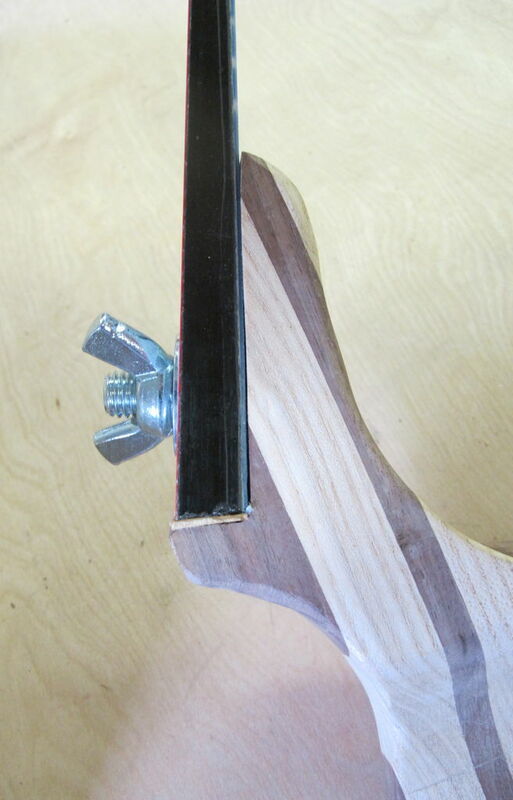 To shave the limb, take a rasp/file or sander to the edge of the tip. If you shave too much material from the tips you can compromise the integrity of the bow. You’ve been warned. It can be done if you’re mindful not to go overboard. I wouldn’t take more than 20% of the material in the top 1/3 of the bow.